We are a leading Manufacturer of air ventilator from New Delhi, India. 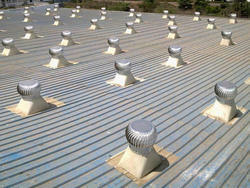 Roof Vents are natural air ventilation systems. Roof Vents utilize the Velocity Energy of wind to induce air flow by Centrifugal Action. The spinning vanes create a region of low pressure, which pulls and throws out hot stale air from below and causes fresh cool air from the outside to come in. Looking for Air Ventilator ?